We're a non-profit organization founded and powered by sorority women on a mission to raise financial resources to help remove education barriers for girls and women facing poverty and oppression. Get involved as a volunteer, donor, or fundraiser today. Educated women earn 25% more income and when women earn an income, they reinvest 90% into their families to break the cycle of poverty. 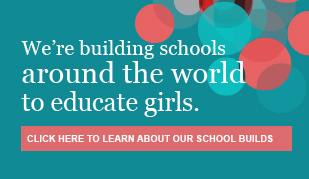 Help provide educational opportunities for girls and women across the world by using your influence and networks. Click here for resources and ideas for fundraising to contribute to Circle of Sisterhood. Circle of Sisterhood has been able to grant over $1,000,000 to organizations working in 24 different countries and has funded 23 school builds in Malawi, Senegal, Haiti, Nepal and Nicaragua since our founding in 2010. OUR MISSION: The Circle of Sisterhood will leverage the collective influence of sorority women to raise financial resources for entities around the world that are removing educational barriers for girls and women facing poverty and oppression.